If Governor Romney wins election as President, his first act, he says, will be to repeal and replace ObamaCare (or more properly, the Affordable Care Act). How will this impact on Medicare and, generally, the dialysis patient population? I already published this but, since it’s an important topic, I am publishing it again for those who may have missed it. In the meantime, I was told this seemed biased. I researched the topic carefully and I thought I was presenting an unbiased point of view. There is only one candidate who’s stated policy is “repeal and replace” so it’s difficult to present this topic without seeming biased but I sincerely tried to avoid that. This article came out today about the penalties that will be imposed on people who don’t purchase insurance under ObamaCare. However, if you are on Medicare, it won’t apply. I’d like to think Gov. Romney has something to replace the ACA if it’s repealed. There was a bill called, “Common Sense Health Reform Americans Actually Want Act” presented in January 2011 but Governor Romney hasn’t endorsed it as his plan to replace the ACA. He has policy points on his website but no specific reference to any legislation. Since replacement would take months or years, the ensuing chaos of ACA repeal would effect states and insurance providers as the struggled to reverse all the provisions that were enacted by ACA. Lifetime and annual caps would return and protections such as for pre-existing conditions exclusions and dependents less than 26 years old would vanish. Repeal of ACA has significant impact on dialysis patients. I’m only interested in the welfare of dialysis patients, not in which candidate gets elected. I hope this is clear. Since the Romney position is to “repeal and replace” ObamaCare, it would be proper to look at the impact on Medicare of both parts of this approach. However, Mitt Romney hasn’t made any specifics of his replacement plan known so I really can’t make any judgement on that. When he comes out with what he plans to replace it with, I’ll look at it and post about it. So, in light of the promise to repeal ObamaCare and with the knowledge that replacing it could take years in Congress, Medicare patients should be keenly aware of what repealing the ACA means. Medicare is intertwined with the ACA to the extent that it’s repeal will reverse several programs that directly benefit Medicare patients and have already gone into effect. There are several provisions in the ACA that decrease the payments to providers (doctors, hospitals, dialysis centers, etc.) in order to save Medicare expenses and extend the life of Medicare to 2024 because of those savings. Repealing ACA would return payments back to the previous levels and decrease the life of Part A (hospitalization) Medicare to 2016. That means that Medicare would be insolvent (unable to pay it’s costs) by the year 2016 unless Congress pumps a lot of money into it to shore up that shortfall. Eventually, it will have to do something because after 2016, Medicare would not be able to cover it’s costs. Cutting Medicare benefits would be one alternative to increased spending. And, because the costs to Medicare would increase with the increase in payments to providers, premiums and payroll contributions for Medicare would increase too. Part B (fee-for-services like dialysis) would also need an infusion of cash which would have to come from increased premiums for Medicare patients. As it is, we currently pay about $100/month for Part B (income below $85,000) and the cost to Medicare beneficiaries would increase because Part B premiums must make up 25% of costs for the program. Logically, if you increase payments to providers, the total costs increase and the premiums do too. The deductibles and co-pays of Medicare are indexed to the payment rates, so these would also increase if the ACA is repealed. This means the Part A deductible which is currently $1156 for hospital stays would increase as would the co-pays for hospitalization and skilled nursing and other costs covered by Part A. The exact amount of deductible and co-pay increases is not known but, because these amounts are indexed, as the costs increase so will the deductible and co-pay. Part D (that covers medications) would also be effected by a repeal of the ACA. The ACA closed the “donut hole” which forced Medicare patients to pay more for medications beginning once they reached the Medicare Part D plan’s initial coverage limit of $2840 and ended when they spent a total of $4,700. The ACA closed this hole meaning that Medicare patients saved an average of $600 each. If ACA is repealed, we’ll return to the donut hole and that savings will no longer be in place. However, Part D premiums would probably decrease after the repeal because the spending for Part D would decrease and, like Part A, they are indexed to the costs. The government pays less so the premium goes down. In the case of Part D, the net increased cost would still be born by the Part D Medicare patient because of the costs of the donut hole (about $600 on average) come back into play. You’d pay less for the Part D premium but more for the medications. The ACA provides that all preventive care co-pays are eliminated so with it’s repeal, Medicare patients would return to paying co-pays for doctor visits for annual checkups and such preventive care visits. The ACA had some revenue enhancements that added to the amount of money brought into Medicare. It increased the amount paid by higher income workers as a payroll tax and it generated income from fees on manufacturers and importers of brand name drugs. In the original analysis, this was expected to bring in an addition $430 billion but the Congressional Budget Office (CBO) recalculated it recently and said it would mean an increase of $700 billion between 2013 and 2022. If ACA is repealed, this additional revenue would be eliminated and no additional income would help Medicare pay the costs. This represents a loss of over $700 billion over the next ten years. The shortfall would have to be made up for in one place or another or in increased premiums for Medicare patients. However, the higher income workers and drug manufacturers would see some benefit as they would be paying less in payroll taxes and fees. The higher income wage-earner would also pay less for their Part B and Part D premiums because those increased contributions are part of ACA which requires those who make more, pay more in Plan B and Plan D premiums. those. Without the ACA in place, the advantage plan managers could offer plans with less benefit “extras” than they currently offer. This reduction in benefits could cause patients on Advantage plans to move back to Medicare, increasing the costs of Medicare and therefore, the premiums paid by Medicare members. This is just a short, quick look at the implications of the repeal of the ACA, or ObamaCare. 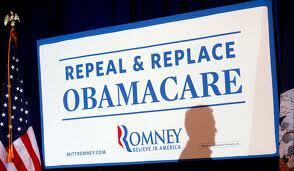 As a campaign slogan, it may sound good but, in reality, a repeal is a very bad idea. It fixed many holes in Medicare and made for a more level playing field for Medicare beneficiaries because of the income-based pricing of Parts B and D. It offers more benefits that the previous Medicare plan because it provides for no co-pays for preventive services which encourages patients to see doctors to prevent costly problems if unchecked. It brings more revenue into a slowly starving system and extends the life of it by several more years. There’s little reason or benefit for Medicare/Dialysis patients to support repeal of the ACA and many reasons to keep it in place. This entry was posted in ACA, Affordable Care Act, dialysis, ESRD, Medicare, Obamacare, politics and tagged ACA, Affordable Care Act, dialysis, ESRD, hemodialysis, Medicare. Bookmark the permalink.